Seagate has unveiled a 14TB helium-filled disk drive in the Exos line. The range appeared in November when various Enterprise Capacity and Enterprise Performance drives in 3.5 and 2.5-inch form factors were rebranded. The range topped out with the Exos X12, a rebranded Enterprise Capacity 12TB helium-filled spinner. Now we have the Exos X14. Seagate's competition at the 14TB level comes from Toshiba's MG07ACA Series with nine platters inside its helium-filled casing and WDC's HGST Hs14 2nd generation shingled and helium-filled drive. Both spin at 7,200rpm, like the Exos X14. We understand it has a 6Gbit/s SATA or 12Gbit/s SAS interface and spins at 7,200rpm, being a data centre nearline capacity drive. It may have nine platters with a 1.56TB/platter capacity level, Seagate isn't saying. The company hasn't released any performance numbers, merely some marketing spiel saying: "The Exos X14 offers the industry's lowest power consumption, smallest footprint, and best performance in its class." 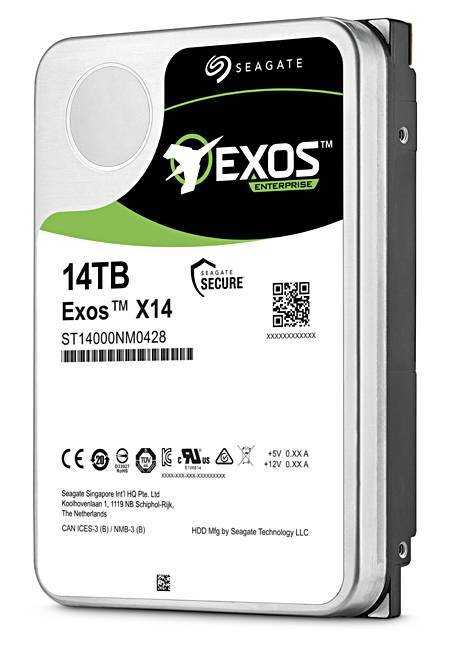 Sai Varanasi, VP for storage devices in Seagate's product line marketing, said: "Exos X14 shines ... by delivering 14TB with leading sustained transfer rates and random IO responsiveness optimized for hyperscale applications." The statements suggest the X14 may have a higher transfer rate than the Toshiba MG07ACA's 298MB/sec. It has encryption and complies with the Federal Information Processing Standard (FIPS) 140-2, Level 2 certification and the Common Criteria for Information Technology Security Evaluation (CC) security standard. Shingled drives are not suitable for normal nearline use, as their rewrite speed is slowed by the block-level read, amend, rewrite process inherent in shingling. Non-shingled drives merely overwrite existing tracks, which is much quicker. We now have Western Digital lagging Seagate and Toshiba due to its lack of a non-shingled 14TB drive in its range. We expect it to catch up promptly. The Exos X12 theoretically provides 1PB of capacity with 84 drives. The X14 bumps this up to 1.17PB – not a huge jump but useful nonetheless. Seagate, casting its net wide, said the X14 could be used for hyperscale applications/cloud data centres, massive scale-out data centres, Big Data applications, high-capacity density RAID storage, mainstream enterprise external storage arrays, distributed file systems, including Hadoop and Ceph, enterprise backup and restore, disk-to-disk, virtual tape, and centralised surveillance. The X14 is sampling with selected customers, like Baidu, and will be followed by production availability this summer. It's on display at Seagate's booth #A14 at the Open Compute Project US Summit 2018 along with Seagate's Guardian Series portfolio, Nytro Q-Boost and HAMR-based drives, as well as the Nytro 5000 NVMe SSD and its MACH.2 Multi Actuator and HAMR technology.